Push-Back Rack uses telescoping carriages to store pallets up to five deep, providing multiple pick facing with extremely high throughput. 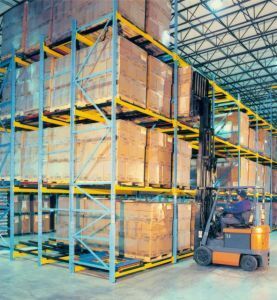 Pallets are fed and retrieved from one aisle, reducing picking times and making these racks ideal for applications that require a large number of picking faces. Before you commit to expensive lease space, give us a call. Many of our Utah Push Back Rack shelving systems will pay for themselves, just in lease savings alone!